East Africa (EA) is a weakly-defined macro-region, with its extent varying from a geographical, cultural, and political perspective depending on the context inquired. This book makes the explicit choice of referring to EA as the area including Burundi, Kenya, Malawi, Mozambique, Rwanda, Tanzania, and Uganda (Fig. 1.1). Furthermore, despite not strictly belonging to the region, South Africa is also accounted for in the analysis. This is due to the strong ties and interdependencies in the energy and economic sectors that South Africa exhibits with EA-7 countries, and to the lessons that can be learned from its emblematic case—an outlier in terms of energy and economic development. 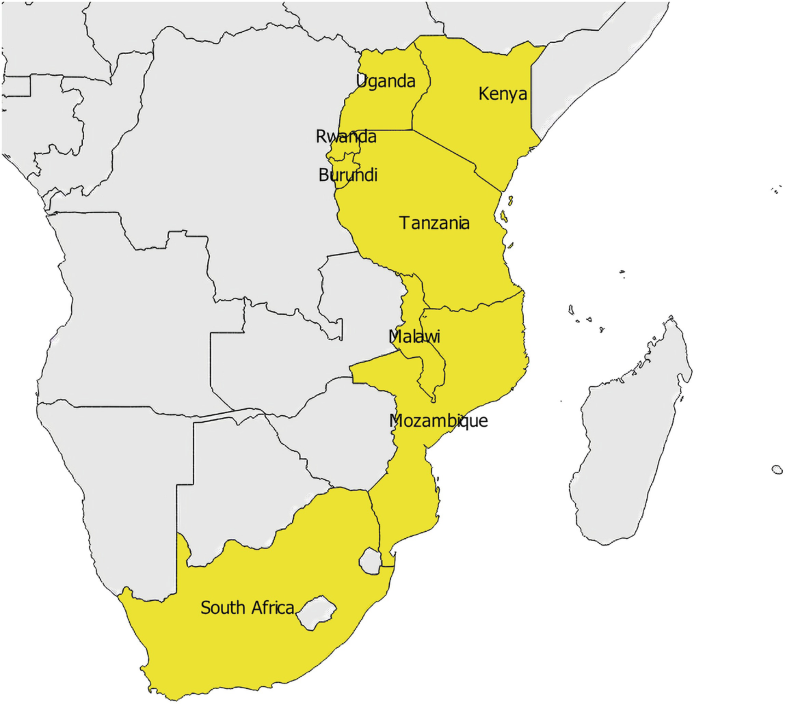 East Africa (EA) is a weakly-defined macro-region, with its extent varying from a geographical, cultural, and political perspective depending on the context inquired. This book makes the explicit choice of referring to EA as the area including Burundi, Kenya, Malawi, Mozambique, Rwanda, Tanzania, and Uganda (Fig. 1.1). 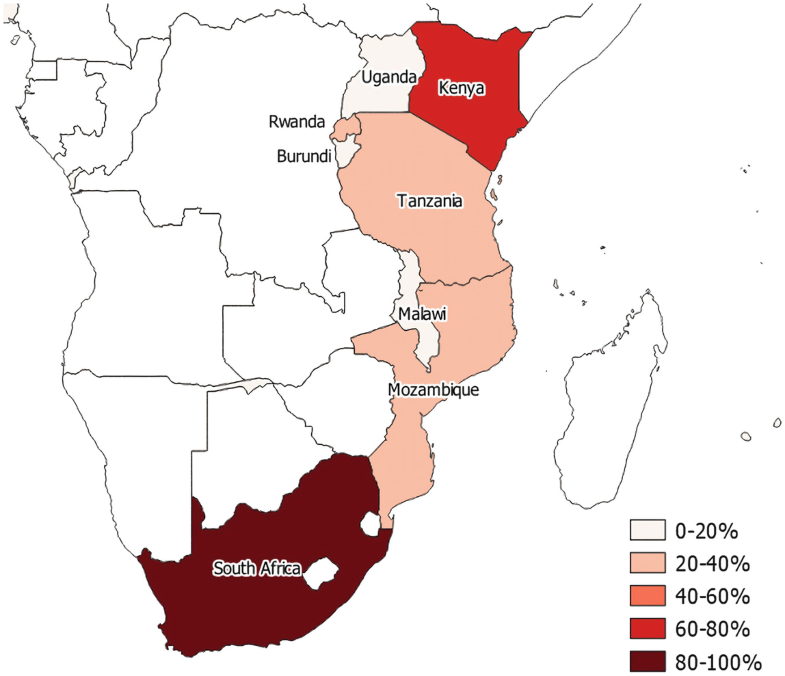 Furthermore, despite not strictly belonging to the region, South Africa is also accounted for in the analysis.1 This is due to the strong ties and interdependencies in the energy and economic sectors that South Africa exhibits with EA-7 countries, and to the lessons that can be learned from its emblematic case—an outlier in terms of energy and economic development. As of 2018, the population of EA-8 stands at 271 million (Table 1.1). On average, it has grown at an annual rate of 2.6% over the last 5 years (World Bank 2017) and it is projected to keep an increasing trajectory. As a result, under a medium fertility scenario it would reach 569 million units by 2050 (United Nations Population Division 2017). EA-7 is also one of the fastest growing regions in the world. In 2017, the regional real GDP grew by an estimated 5.9%, although with substantial country heterogeneity, and it is forecasted to keep a similar pace in the coming years (AfDB 2018). Notably, the industrial sector has been growing at a double pace vis-à-vis agriculture, dragged by a skyrocketing mining activity. The demand-side is playing a considerable role in pushing economic growth, with consumption and public investment in infrastructure paving the way. Nonetheless, the aforementioned growth has hitherto led to only limited poverty reduction and the real GDP/capita in EA-7 countries is still among the world’s lowest. Many inhabitants of the region face extreme poverty, lack access to safe water and health facilities and exhibit high malnutrition and low education levels, while inequality indicators are also stagnating. The key challenge faced by EA-7 countries is therefore to promote their national development, with the emblematic objective of abandoning their status of low or lower middle-income economies. Those are defined as countries “having a per capita gross national income of US $1006 to $3955” (World Bank). As of today, South Africa is the only member of that club from the region. In this context, one of the main obstacles (if not the main one) for unleashing the regional growth-potential is to develop its energy resources and its power sector and provide access to sustainable energy to the entire population. Currently, EA-8 hosts 3.6% of the global population but accounts for only 1.5% of total global primary energy consumption (IEA 2017a), which becomes 0.2% if South Africa is excluded. Moreover, as shown in Fig. 1.2, the regional population served by some form of access to electricity currently stands at 39% (IEA 2017b), with very low per-capita consumption levels and more than 150 million people living without access. It is important to outline that the successful achievement of most development objectives is highly dependent on meeting the challenge of electrification and improved energy access, due to the strong interdependencies between the energy sector and virtually all other economic activities. Since, in principle, some development targets could show a certain degree of competition rather than complementarity, especially in low-income countries where available resources are scarce, action needs to be taken with a multi-level approach, i.e. it needs to consider impacts and externalities on the economic, social and environmental spheres. With these issues in the foreground, in 2015 the General Assembly of the United Nations agreed to work towards 17 Sustainable Development Goals to be achieved by 2030, with their progress being measured through 169 targets (United Nations 2015). The framework is one of multi-objective development, where economic growth is to be achieved alongside affordable and clean energy diffusion, poverty eradication, zero hunger, good health, and other development goals. As far as this book is concerned, the achievement of one of these goals is particularly relevant, i.e. the SDG 7, which sets the objective of ‘ensuring access to affordable, reliable, sustainable and modern energy for all’, with focus on access to electricity and to clean cooking; on increasing the share of renewable energy (RE) in the total generation mix; and on the upgrade of energy services in developing countries. A multitude of studies have been carried out to assess the potential of renewable energy (RE) in enabling the development of the energy sector, the expansion of electricity access and thus the development of countries in Sub-Saharan Africa (SSA). Here, we report some of the most recent and influential contributions from international institutions and academic scholars, to later introduce the elements of innovation brought by our analysis. IRENA’s Africa 2030: Roadmap for a Renewable Energy Future (2015) provided a comprehensive roadmap for Africa’s energy transition. It focused on RE, and it concluded that half of the development potential from modern renewable energy resources and technologies would be represented by biomass-based heat applications, which would progressively displace traditional biomass combustion. The report: (1) builds on a regional assessment of supply, demand, renewable energy potential, and technology prospects; (2) discusses country-by-country the role of enabling policies and of regulatory framework in catalysing investment, as well as other measures to attract investors and to promote off-grid renewable solutions so to increase energy access and boost welfare. PBL Netherlands Environmental Assessment Agency’s Towards universal electricity access in Sub-Saharan Africa (2017) estimated the investment requirements for achieving universal electricity access by 2030 (as put forward by SDG 7) at additional USD 9–33 billion per year in the 2010–2030 period on top of business-as-usual investment. In the report, the key role of decentralised electrification systems is outlined, both in terms of mini-grids and stand-alone systems. Furthermore, it claims that while renewable energy generation will become increasingly competitive, fossil fuels would continue to play a significant role in future electricity production in SSA. However, the report also suggests that achieving SDG7’s target would have only a small impact on global CO2 emissions, compared to a situation in which this target is not achieved. The IEA’s 2017 Energy Access Outlook (2017b) agreed upon the fact that decentralised systems, and mainly solar PV, would be the least-cost solution for roughly 75% of the additional connections needed in SSA. The report then focused on the issue of clean cooking, and it stressed the necessity of a transition from solid biomass through the deployment of LPG, NG and electricity in urban areas, and a range of technologies (improved biomass and cooking stoves) in rural areas. Furthermore, the involvement of local communities, especially women, when designing solutions was highlighted. 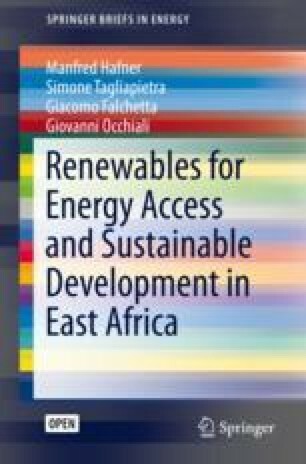 On the specific case of expanding and improving energy access in EA, Othieno and Awange (2016) authored a chapter on energy resources in EA in their book Energy Resources in Africa. They observed that only a small amount of locally available energy resources has been developed in the region. The main underlying problems that the authors identified are associated with the low level of local technological capacity in RE technologies and the hitherto inadequate support for energy development initiatives. Furthermore, throughout their book they highlighted that information on specific energy sites that could guide potential investors, including their commercial viability, is not readily available.2 The fact that energy provision policies in EA countries are not well coordinated and hence very difficult to implement is also evidenced. Moreover, the authors argued that most RE resources have not been properly recognized for their commercial significance at the national level, and thus that an imbalance in the level of support to the development of different energy resources has been witnessed in the past years. Byakola et al. (2009) produced a report on Sustainable Energy Solutions in East Africa based on the experiences and policy recommendations from NGOs in Tanzania, Kenya and Uganda. They pinpointed the effectiveness of investment in small and medium-scale renewable energy projects among the rural and urban poor. Conversely, they listed the key challenges faced by international actors involved in the electrification process in EA. The issues include the fact that national policies and institutional framework are not giving sufficient leverage for entrepreneurs to consolidate or tap into new energy business ventures, and thus that potential entrepreneurs face high initial investment costs and associated risks. On the demand-side, they highlighted the fact that most potential end-users of modern energy services cannot afford to pay upfront for the products and services offered by the entrepreneurs while end-user financing is equally not well-instituted. Overall, they underlined the need to foster participation of different stakeholders in decision-making. They suggested a standardised roadmap of energy project development with the following steps: (1) identification and selection of target areas, (2) local information collection, (3) participatory problems identification, (4) needs and opportunities assessment, (5) demonstration and awareness raising, (6) capacity-building for scaling-up through market development, (7) participatory monitoring and evaluation, and (8) learning and replication with adaptation. REN21 and UNIDO’s (2016) Renewable Energy and Energy Efficiency report on EA highlighted that the East African Community is the second largest single regional market in Africa and one of the fastest growing regions in SSA. It reviewed the key features of the energy sector, and provided a renewable energy market and industry overview, discussing heat, electricity, and transport uses. It then highlighted targets, power support policies, and it discussed the question of energy efficiency, with consideration on the energy intensity with which the system develops, as well as on transmission and distribution networks and on policy aimed at favouring efficiency in use. Concerning investments, the report stated that between 2009 and 2013, the East African Community (EAC) attracted approximately USD 5.8 billion in aid from the international community, with more than 80% of total EAC energy investments having been channelled into geothermal and wind projects in Kenya. Kammen et al. (2015) demonstrated how the combination between a growing demand for energy and a series of new fossil fuel discoveries in the region, coupled with a better understanding of its RE potential, have led to a defining moment for the uptake of a sustainable (or unsustainable) regional resource management trajectory and development path. They highlighted the significance of the Eastern African Power Pool (EAPP) in the process as a driver of investment, a catalyser for the on-grid and off-grid investments, and a mechanism to mitigate climate (e.g. droughts and derived hydropower disruptions) and energy demand-related (e.g. peaks) risks. They also discussed the role of Kenya as an emerging clean energy leader in EA and in SSA, with visions of 5000 MW of new on-grid capacity in only 40 months. Hansen et al. (2015) discussed solar PV policies and diffusion in EA with a regional perspective, individuating two emerging trends: (1) a movement from donor and government-based support to market-driven diffusion of solar PV; and (2) a transition from small-scale, off-grid systems towards mini-grids or large-scale, grid-connected solar power plants. The authors identified three key drivers behind the ongoing transitions, namely the decline in the cost of PV units and thus of the levelized cost of PV, the role of international donors, and domestic policy frameworks such as feed-in-tariffs. Interestingly, the paper also discussed some of the reasons which are likely to have paved the way to Kenya becoming the RE leader in the region. Among these, the growing middle-class, the favourable geographic conditions (in terms of cheap wind and geothermal potential), local subcomponent suppliers and backers, and the existence of a national business culture. Overall, these and further studies highlighted the following key points for energy development in EA-7: (1) potential, both in RE and hydrocarbons is large and more than technically enough to guarantee energy self-sufficiency, (2) the development of the integrated power pool network is of upmost importance to minimise risks and cut costs, (3) enabling conditions play a big role, and Kenya is being a virtuous example in this sense, (4) the EA-8 region is currently in a critical juncture for its energy development trajectory: local policymakers should be supported by researchers and the international community with resource mapping, least-cost electrification scenarios, and policy recommendations based on previous success stories. This book contributes to this literature and it presents different elements of innovation with respect to the previous studies. It specifically focuses on EA, accounting for the local configuration of access and resource endowment, and addressing economic, technical and policy questions. In Chaps. 2 and 3, it presents a standardised and extensive energy resource mapping, highlighting the status quo, development plans, ongoing energy infrastructure projects—including grid expansions—enacted regulation, and overall untapped technical potential. The focus is put on RE sources for power generation purposes (i.e. excluding the direct combustion of solid biomass), including solar PV and CSP, wind, hydropower, and geothermal. A comprehensive RE atlas (including maps, estimated potential on a resource-basis, and current policy in place) for the specific case of EA could in fact not be found among previous recent publications. In Chap. 4, least-cost electrification scenarios are modelled to provide policy-relevant insights on which level of penetration of different technologies would be required to achieve 100% electrification by the year 2030 while also satisfying the growing demand from already electrified household and the emerging industrial sector. The chapter also covers both the capacity additions required and the total investments necessary to achieve this objective. The analysis is not limited to a modelling exercise, since in Chap. 5 specific attention is paid to the main issues faced in the accomplishment of a faster, more inclusive and cost-effective energy access in EA-7. This part covers technological, economic, cooperation, policy, and financing conditions, as well as the opportunities and risks involved in the development of a portfolio of renewables to promote energy security in a sustainable way. Chapter 6 then discusses the challenges and opportunities that might stem from the interaction between local RE potential and NG resources currently under development in the region, while also referring to the results of the electrification modelling exercise. To conclude, policy recommendations based on our results and targeted at international cooperation and development institutions, local policymakers, and private stakeholders in the region are elaborated. Throughout the book, the EA-8 acronym denotes all EA countries including South Africa, while EA-7 excludes it. Recent open-data and open-source modelling initiatives from the World Bank and SolarGIS, the IRENA, and the KTH Royal Institute of Technology are precisely aimed at tackling the challenge.